I recently won a chocolate giveaway from Cake… or Death? I was SO excited when the mail arrived on Friday. My chocolate dreams came true! 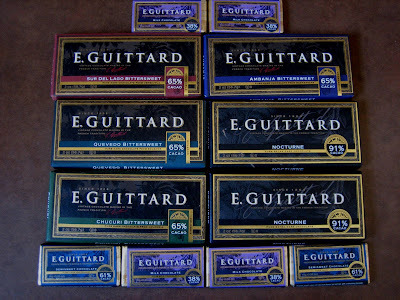 Liz sent me several bars of E. Guitard chocolate. The big bars are going to be great for baking and the mini bars are so cute…perfect for sampling!! Thanks Liz for the fabulous giveaway!! We love your blog!! I have the greatest husband…I really do! I won’t go into my long list of reasons why he is so great, but I will tell you that he baked me a fabulous surprise! He used some of Liz’s chocolate and made me Chocolate Toffee Brownie Bites from The Good Cookie, by Tish Boyle. Josh knows brownies and toffee are my favorite so he found a treat that was doubly delicious! The brownies were chewy, moist, and had a hint of almond…which I loved! The brownies were smothered in chocolate ganache and sprinkled with toffee. They were the perfect bite size brownie. Thanks Joshua for spoiling me!! I was so impressed! Josh did an excellent job! 1. Position a rack in the center of the oven and preheat to 325 degrees. Grease a 24 cup mini muffin tin and dust with flour. 2. In the top of a double broiler over simmering water, combine the butter and chocolate and heat, stir occasionally until melted and smooth. Transfer the mixture to a medium bowl and cool until tepid. 3. Sift the flour, baking powder, and salt together into a medium bowl. Stir until combined. 4. Stir the sugar, eggs, vanilla, and almond extract into the chocolate mixture until well combined. Add the flour mixture and stir. 5. Spoon batter into mini muffin tins. Fill them two-thirds full. Bake 14-16 minutes, until set but still soft in the center. Let them cool on a rack for ten minutes in the pan. Invert the brownies onto the rack and cool completely. 6. 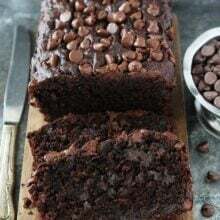 In the top of a double broiler over simmering water, combine the chocolate, cream, and corn syrup and heat, stirring occasionally, until the chocolate is melted and smooth. Remove the bowl from the heat and stir in toffee bits. 7. Place the rack with the brownies on it on a baking sheet. 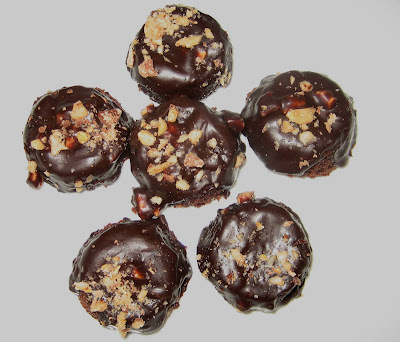 Arrange the brownie bites, still inverted, so that they are 1/4 of an inch apart. Pour the glaze over the bites, covering tops and sides. Smooth the glaze with a metal spatula. Sprinkle extra toffee bits on top! Chill for ten minutes or until set. Serve at room temperature or chilled. Store extras in the fridge. Oh, you two are becoming quite the dynamic duo in the kitchen. What a lucky win and you certainly made good use of your chocolate. Congrats on your bountiful win. Your husband deserves an award himself for those amazing brownie bites. Congrats on your choccie win! Wow those Brownie bites your hubby made look so yummy! Yummy in your tummy you lucky girl. What a sweet husband… Mine only cooks bean and cheese burritos. The brownie bites look really tasty and pretty. Congrats on your win. I don’t know what ya’ll do for a living, but you should open up a bakery! Count me in for the grand opening! So jealous of the chocolate! And those brownie bites look amazing! I am going to copy down that recipe..wow that sounds good. Your pictures are so nice. Your hsband sounds like a wonderful man…I too could go on and on how great my sweetie is..we are blessed! I was looking for your TWD cookies..did you bake them? Also it’s nice to meet a neighboring state..Im in IDAHO! Keep baking and keep that man..Ha! Sorry for all the typing errors..I get in a hurry! whaaa? he did it on his own? amaaazing. congrats on the chocowin! Wow, he really did a great job. He is a keeper! What a sweet husband! Great job on those brownies, they look wonderful! I am jealous of your choclate-and the treats it turned into. yum! Not to mention that delicious lasagna, can I come over the next time you make pasta? Thanks for the comments. I am a lucky gal! Joshua always spoils me! Flourchild-Where do you live in Idaho? We aren’t too far! Leslie-Josh is turning into quite the chef/baker! We have fun! Natashya- Josh does the dishes too:) We are a great team. Mary Ann- You are invited anytime! 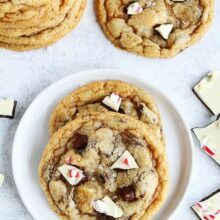 Wow–those look amazing!! I am very impressed that your hubby did that! Congrats on the win–what a lucky girl you are. I love your blog!! You are very lucky! I wont be holding my breath for my hubby to bake me something thats for sure!! Those look so delicious. I’m not sure what made me drool more, the brownie bites or that photo of all of that chocolate! 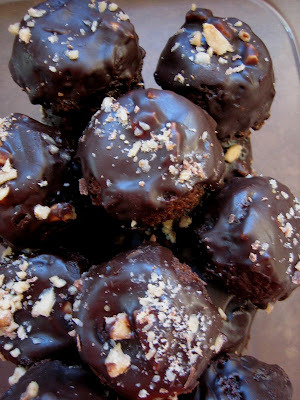 Good god these look so decadent! I cant wait to try these out 🙂 And its not fair to tease with those pics! You are so lucky to win such an amazing prize! Our selection of chocolate in Canada is really limited and I’ve never tried all the wonderful varieties used by other bloggers. 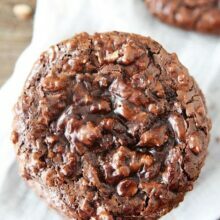 The brownie bites look wonderful! The best part is that they’re bite sized. I’m so jealous of that chocolate! And those brownie bites look GREAT! Wow, it doesn’t get much better than that! Free chocolate and a nice husband to bake it up into a lovely treat. Congrats! Congrats on the chocolate! And a hubby who makes you brownies? You really hit the jack pot! 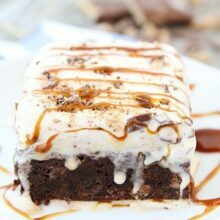 Ah, brownies are also one of my favorite desserts! Even better when they are glazed, yum! … So how do we get in on this winning CHOCOLATE did ya say?! OMG..That sure was a nice package you got in the mail!! CHOCOLATE is by FAR my favorite food! Thanks for your comment on my video post! That wonderful man that is Maria’s husband is my wonderful son! He is an awesome person, and yes, he does do dishes! I have seen him! Great job Joshua, keep spoiling your sweet wife! .. she deserves it. Oh, those look so yummy! I love brownies – this just makes them look that much better!